$200. Gift Certificate donated by Mike Stannard of One Sixth Icons. CVI custom insignia set donated by CVI set may vary from pic , sorry no choice. Other comparably cool prizes as needed depending on the number of entries recieved. If you enter you are a winner! So please come on over and join us in celebrating our new board. We look forward to seeing you there. WOW awsome prizes!!!! Even the third place has some wicked prizes....Thanks to all who put this together! I hope we have more contest in the future! RAS, The dollar sign in front of the 50 and decimal point behind it means fifty dollars rather than .50 which would be cents. That's $50. USD to be precise. It's a great and generous prize from a friend of the SAG. And all the guys in "Cadre" who donated the 250 Alt that is the centerpiece of our Grand Prize. they are the core of our hobby and deserve to be recognized. I hope I'll have some pix of my gear ready for the next contest. Darn nice prizes for the winners. These are awesome prizes. I'm sure the entries will be just as awesome. Can't wait to see 'em. 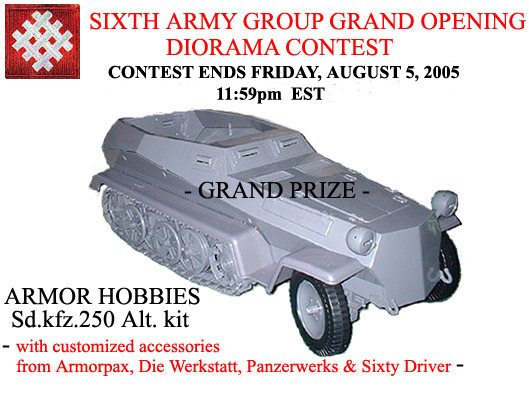 Did Wayne ( sixtydriver) decide not to contibute the german radios for grand prize, 1st and 2nd? Haven't forgotten you Dennis, just slower than usual. You should have it in about a week. Thanks Wayne, I gotta have one of your radios in my collection. Thanks for asking Dennis, I was wondering myself! Looking forward to that beauty also!